During the last few years, SoLoMo (social, local, and mobile) have remained the defining trends in marketing, and data has played a crucial role in their advancement. In 2015 these trends will continue penetrating deeper and expanding wider in the global market, and data integration will be more pervasive. Remarkably, new AdTechs like Internet of Things (IOT) and wearable technologies will begin taking off and contributing greatly to marketing. During 2015, Big Data will continue to be an all-powerful and overarching topic among business planners and marketing strategists. As businesses realize that customer behavior and usage data is pivotal for leveraging their overall performance and profit, more businesses will adopt Big Data policies and data acquisition and integration technologies. That customers are no longer repeatedly bombarded by the irrelevant advertising messages will be the biggest impact of data integration in marketing. Instead, with accurate data, the messages will be more focused, contextualized, and relevant. Data will play a key role in maximizing the outcomes of the current over $120 billion online advertising economy. Today, mobile has become the most popular and rapidly proliferating multi-functional digital device with a huge impact in digital marketing. The first thing many people impulsively do before going to and getting out of bed is browse through their mobile. They tend to spend more of their time on mobile (for from locating the shopping facilities to providing social media recommendations) than any other device which has made mobile an attractive marketing platform. As a major driver of the new trends like social, programmatic, and native marketing, mobile is going to have a huge multiplier effect in the marketing campaigns in 2015. Meanwhile, what is equally important about mobile is the generation of the user data which is becoming a new gold mine for marketing. In the recent years, content has become an indispensable part of marketing, offering enterprises an opportunity to share knowledge and information with their customers as well as to constantly engage them in conversation. Studies have shown that effective content marketing contributes in a great deal to the improvement of consumer conversion and retention. In 2015, firms will focus on improving the quality of the contents so that they ultimately contribute to increased ROI, not just the click-streams. This step will lead to the creation of the mix of high quality, customized, and interactive contents. No doubt, customer data will continue playing a vital role in the process of content creation and distribution. 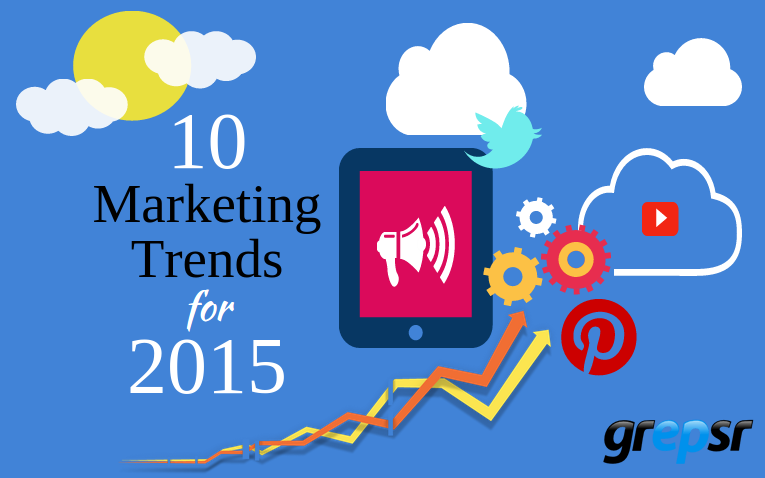 In the brief span of about a decade, social media has revolutionized marketing globally. Today, social media has become a synonym of a powerful marketing tool. In the last few years, it has successfully implemented some innovative experiments, including the streaming of highly personalized ads and contents. 2015 will see an increased ability of the social media sites to use customer data in carrying out user sentiment analysis and tailor their ads accordingly. Additionally, with social media, businesses will grow their social listening capabilities, which will make the readjustment of the marketing strategies in the real time possible. With the introduction of the buy buttons, social marketing will inter into the era of social shopping. Also known as ‘mix media marketing’, multi-channel marketing has become a prominent trend of digital marketing. The assumption is: the more diversified marketing channels you use, the more segments of audience you can reach to. To achieve this goal, businesses are already using social media sites like Facebook, Twitter, and LinkedIn; direct marketing tools like company blogs, e-mails, SMS and promotional mails; video channels like YouTube and Vine; visual-sharing platforms like SlideShare, Flickr, and Pinterest; and audio-streaming channels like SoundCloud. Meanwhile, they are also using traditional channels like radio, TV, newspapers and billboards. In 2015, there will be a remarkable growth in the use of multi-platform / multimedia marketing, with special focus on the growing number of smartphone and tablet users who are proven to be more responsive to the direct marketing messages on their devices. Recently, there has been a huge comeback of regiionalization, localization, and personalization. Because every geographical location and every individual have their unique specificities, understanding those specificities and accommodating them in the marketing policies helps to gain a competitive advantage. During the recent days, retailers have seen that offering custom-tailored products and services to fit the specific needs of the customers significantly improves sales, and personalization has become the best expression of customization. With increased sophistication, personalization will continue be at the forefront of the marketing priorities in 2015, and businesses will keep their focus on improving the interactive web experiences and on providing uniquely personalized products and services that speak to the individual’s needs. The question how websites are able to target, for example, a prospective vacation taker with the highly relevant ad banners or displays about airticket, texicab, hotel, local attractions etc. and how those ads follow the user across different devices no longer remains a mystery. With the improving access to data and data integration capabilities, more businesses will reap the benefits of ad retargeting, effectively implemented by internet giants like Google and Facebook. Visual contents and videos have far greater chances of being viewed, shared, and going viral in comparison to textual contents. People have an inbuilt bias in favor of colorful images and visual objects. These days, visualization and visual storytelling have found a renewed emphasis in the digital media. Visual contents and visual-based sites are becoming increasingly popular than the traditional ones. Pinterest is an example. Video ad is becoming the top priority for the online publishers and advertisers. In September 2014, Mashable reported that Facebook serves 1 billion video views a day on average. There is no doubt that marketing would be more visual oriented in 2015, and social media will be a great enabler of this trend. Digital marketing and online advertising are no longer confined to traditional marketing/advertising agencies. Online shopping, digitization, and datafication have expanded the space of marketing to include data warehousing companies and business intelligence platforms. Advertising today has become a multibillion multilateral collaborative business, involving big data companies and data scientist as key players. The techniques have grown far more complex than airing messages to the unknown audience, unsure about its effectiveness. The sharing of skills across various platforms is contributing to the effectiveness in developing ad contents and in measuring their impacts. As more businesses take data-driven marketing initiatives, the scope of skill sharing and collaboration is bound to expand further in 2015. In 2015 Big Data analytics—and its subsets like business analytics, predictive analytics, web analytics, sales analytics, social media analytics and so forth—will be hotter than ever. According Forbes (referred to IDC), Big Data analytics business will grow to $125 billion in 2015 worldwide, covering a wide variety of areas and creating newer avenues. As data continues growing exponentially, becoming a decisive factor in strategic planning, more businesses will incorporate advanced analytics technologies in their decision making processes. These technologies will significantly improve their capability of collecting and crunching a huge amount of streaming data and take important decisions in the real time. IDC projects that automated services, machine learning algorithms, and intelligent augmentation will further enhance analytics technologies, helping businesses to overcome the shortage of knowledge-based data management workforce they are facing today.